As promised a sneak peek of my boudoir! Almost too pretty to sleep in! I wanted my bedroom to feel more like a suite! The Bedding Set is from Macy's - Oddly for some reason it photographs sort of 'brown' but the colors that actually run through this set are black, white, pink and purple (thankfully purchasers who reviewed it were kind enough to share this, which help solidify my decision as I ordered this set online not in store). 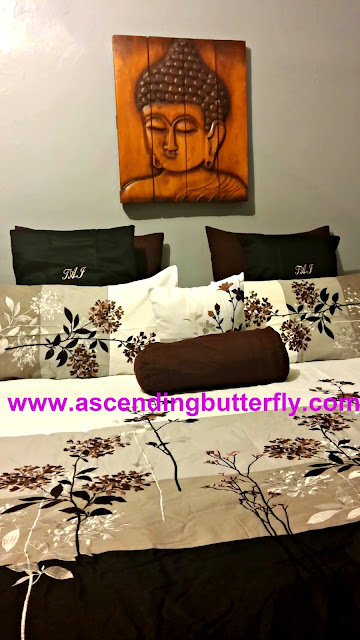 The monogrammed pillowcases are from a Luxor Linens Valentino Sheet Set (press on the link to see my previous review of them) - and by the way the initials are 'T.A.I' not Taj (although I like to visit the Taj Mahal Casino when I go to Atlantic City!). The curtains are from Hayneedle and they are purple and grey (the purple in the curtains are picked up by the purple in the bedding set and dust ruffle) and the Buddha Wall Art is from Cost Plus World Market - I loved this piece so much I bought two of them and the other is in my Foyer so it's the first thing you see when you enter. I love how cohesively it all comes together! Especially since all of the items were purchased very far apart from one another time wise and at different retailers. The walls were freshly painted in Grey, A matte that has the lightest trace of blue in it and is making me all kinds of happy. While there is way more to be done I have purged about 10 bags of stuff I no longer needed and I am loving my 'bedroom zen vibe'. So there it is butterflies a peek at my boudoir! Readers Sound Off: What Vibe are you trying to bring to your home for Spring? FTC Disclosure: This is NOT a sponsored/compensated Post these items were purchased by me personally and NOT sent to me. All opinions are 100% my own! I am disclosing this in accordance with the Federal Trade Commission 16 CFR, Part 255 - Guides Concerning the use of endorsements and testimonials in advertising, you may check our Giveaway and Disclosure Page for additional information regarding Ascending Butterfly Disclosure. That is one fancy bedroom. I don't think I've ever slept in a bedroom that nice. We re-did our bedroom last spring and I am thinking of re-doing that space again. Our house is filled will neutral colours and I would love to add some turquoise and pink. We are toying with painting too but that's a BIG job! I love that comforter! I have a kind of boring one right now and I've been looking for something new. This might be just what I need. 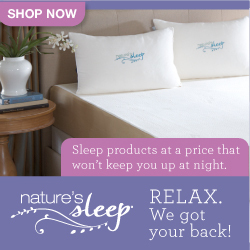 Your bedding set is so pretty! I would love to redo my bedroom decor sometime soon. I'm trying to get a head start already in my Spring cleaning. I have amassed four small boxes already, and still trying to get more. LOL! Spring is finally coming! I love this bed spread. I would love to update my room with these colors. I am thinking as well to start spring cleaning in an earlier time. Your bedroom looks nice and comfortable. Simply beautiful! I love the design of the sheets. I also love the color combination. 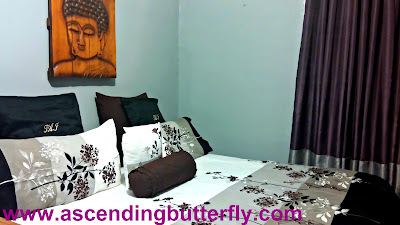 This Luxor Linens Valentino Sheet Set is just amazing a I love the Buddha Wall Art too. Love the bedroom and the style. Love the bedding design, it looks very clean and refreshing. I have to start doing my spring cleaning starting in my closet. The print on the comforter & pillows really adds flare to the room! It's a minimal design move but definitely makes a bold statement in the bedroom! Thank you for sharing! That looks very nice. I really love the bed sheets. They're very pretty! I would love to have a set like that. Love the whole design of the bedroom! We're trying to declutter this Spring so minimalism is our theme! I like your look, it really does look like a suite. I want to use pastel colors in my room this spring.. Not sure that's a vibe though. Your room looks beautiful. I need to work from your example and purge unneeded stuff! Your bedding set is so pretty! I really like it and love the colors too! OHHH! What a beautiful bedroom from the lovely color you choose to the bedding .I hope it brings you much joy ! Namaste day Girl !! !